I can't believe it was 2 weeks since we left for Miami Beach! I am still missing that warm weather! This week I will be recapping our wonderful mini vacation! We flew out of Newark on Continental (United). It's funny, because when we booked our flights I was happy we chose the 9am flight because it seemed like a totally reasonable time. That is until I remembered that meant we had to leave our apartment at 6:30 am in order to make it in time. 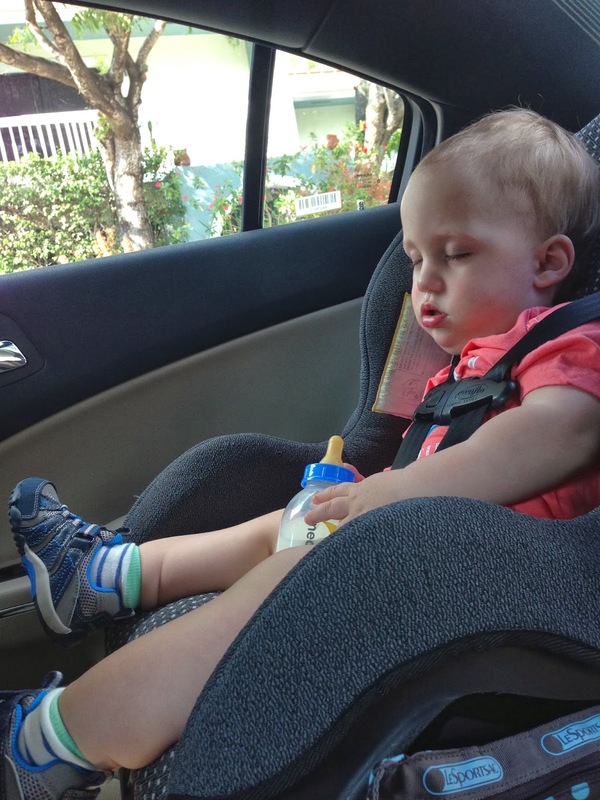 Noah is a great baby and normally sleeps until 7/7:30, so I was totally ready to have to take him in the car in his PJs. Thankfully, it didn't come to that and he woke up at 6am when Chris came to wake me up. My mom came to our place so she could drop us off at the airport in our own car (because of the car seat). I'm so appreciative for that because it made drop off so easy! We checked 2 suitcases and had 2 duffels and a book bag and purse as our carry-ons. Security took longer than I expected. Not because of the extra stuff (stroller, baby, and bottles of milk) but simply because the lines were super long! We made it through without a problem and went to our gate before finding some breakfast. We were surprised that they didn't have priority boarding for people with children, but I guess things have changed. Thankfully, we didn't have any issues even with boarding late and we were able to gate check our stroller at the last minute. We had booked a window and an aisle seat in hopes that it wouldn't be a full flight and we'd get an empty middle seat between us, but no such luck. We figured who ever booked the middle seat would be happy to find out they got a window seat instead. 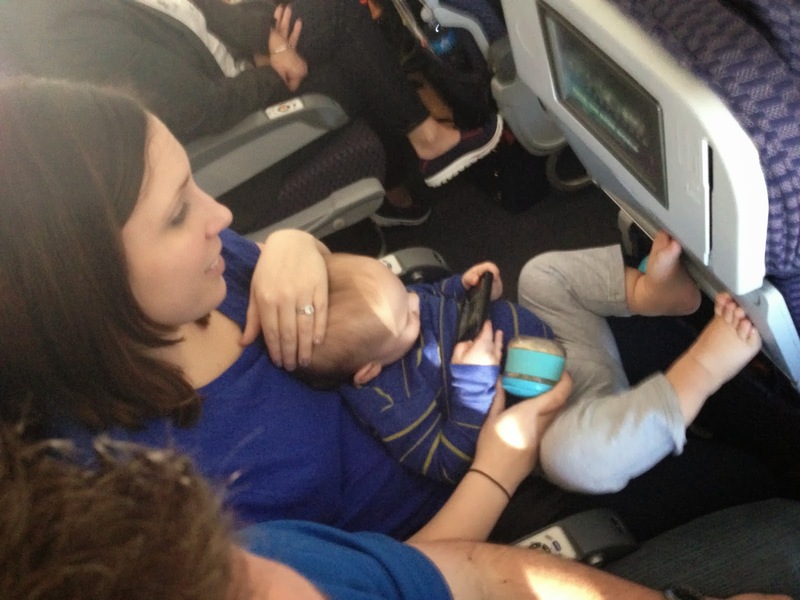 This was Noah's first flight, so I really had no expectations of how he would do. 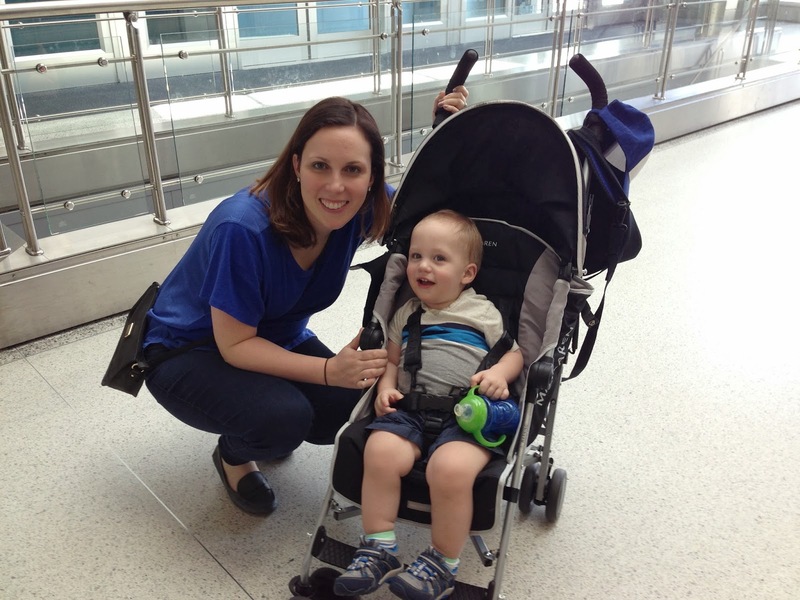 I plan on doing a separate post with tips of flying with a toddler, but let's just say that Noah did great! The flight was only 2 1/2 hours, and he played for the first hour and slept for the last hour and a half. I don't know how we would have done with a longer flight. When we arrived in Miami it was noon. We decided it was best to eat lunch right away to keep Noah happy. There was a Pizza Hut really close to the gate we landed at, so we decided to just eat there before we even got our luggage. We then changed Noah into his shorts and t-shirt and went to baggage claim. I guess we took longer than I thought, because our bags had already been taken off and were in a roped off section. We just had to show our ID and we got our bags. That's when we found out that Miami airport doesn't have the rental car agencies on site! So we had to walk really far to get on a tram that would take us to the offsite location. We had contemplated bringing our car seat, but after talking with Natasha, decided to rent a car seat with our rental car. Chris was relieved to not have to carry the large car seat on his back as well as dragging our rolling luggage and carrying our carry-ons! 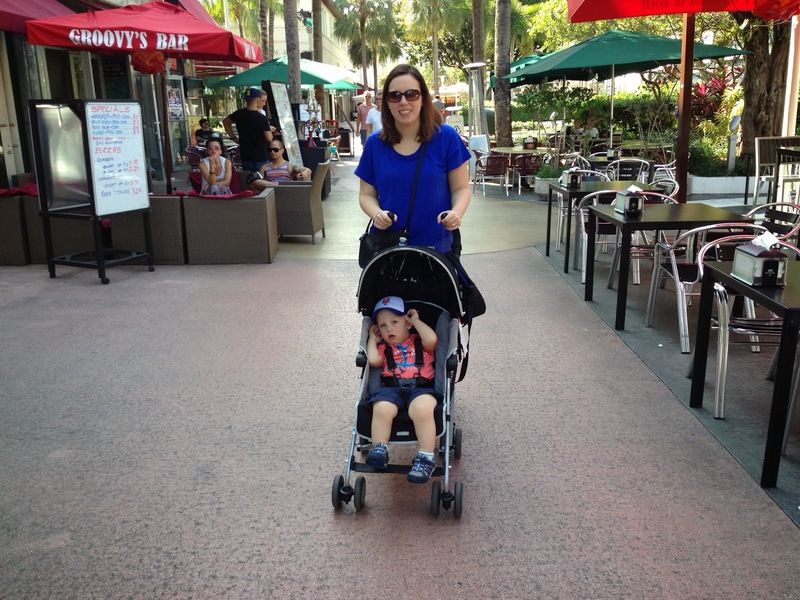 I wasn't much help since I had Noah to push in the stroller. Before heading the hotel, we stopped at Target to pick up some supplies. We got diapers, wipes, milk, water, soda, cereal, and some yogurt so that we could eat breakfast in our room. Noah fell asleep in the car, so Chris went in and I stayed with Noah in the car :) After getting our supplies, we checked into our hotel. We stayed at the Palms Resort and we were thrilled with our choice. It's not located in the action that Miami Beach is known for, but that's what we wanted. We loved the grounds and that it was quiet but still close to all the restaurants. The room was very nice and clean, but I have to mention how weird the bathroom situation was. The shower was amazing, with a rain head shower, but the shower and sink was separate from the bathroom. And when I say separate, I mean separate. When you walk into the room, directly in front of you is a sliding door leading to a room with just a toilet in it. The toilet had a sink where the tank usually is. It had a sign that said the toilet flushed using the power of the sink water. So when you pushed the flusher, the sink turned on and stayed on for about 2 minutes. Weird, but very green :) Then you have to enter the room, turn the corner, and go past a closet to get to the rest of the bathroom. And that's where the big sink and shower were. I loved the shower, but Noah wasn't a big fan. I guess he's just used to his bath tub and doesn't like change. After quickly dropping off our bags and stocking our mini fridge with the cold stuff, we headed off to dinner. We had made reservations at Caffe di. no Mozzarella ahead of time and we were very pleased with our choice. Noah used to be the best diner, but since he's learned to walk, he gets bored quickly and wants out of his high chair. Tonight was no different and it was hard to keep him entertained. Chris eventually had to just take him for a walk so I could eat my dinner. ^^^ We got a mozzarella, tomato, prosciutto appetizer to share. 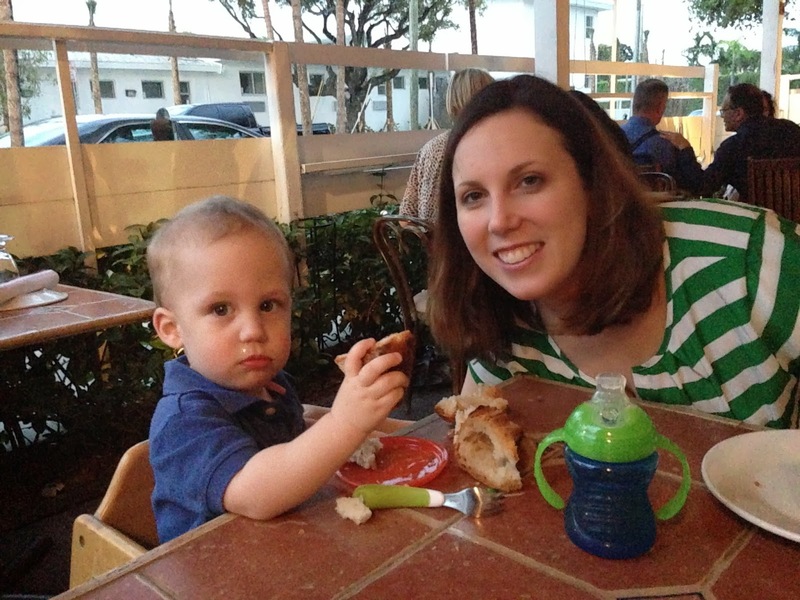 I got a very meaty lasagna, Chris got gnocchi, and we ordered a super delicious meatball for Noah. We were back in the hotel by 8 pm and Noah fell asleep super fast. We opted against getting a crib for the room, and just had him sleep in between us in the king bed. He always ends up in our bed at home anyway, so it really wasn't much different. The room wasn't huge, so I was glad to not have a crib in there taking up even more space! I will be back tomorrow recapping Day 2 in Miami Beach! Oh, how fun! 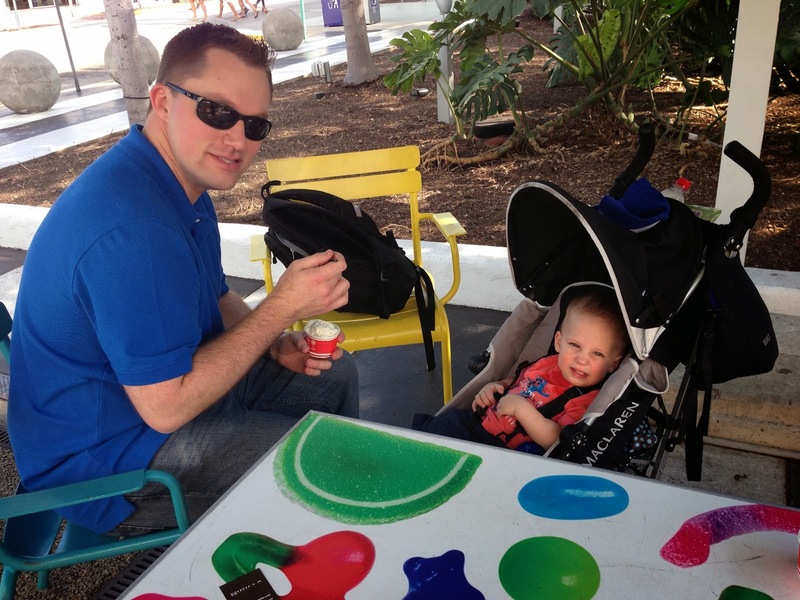 I'd love to be in Miami right now :) That's great that you had a chill flight with the baby! 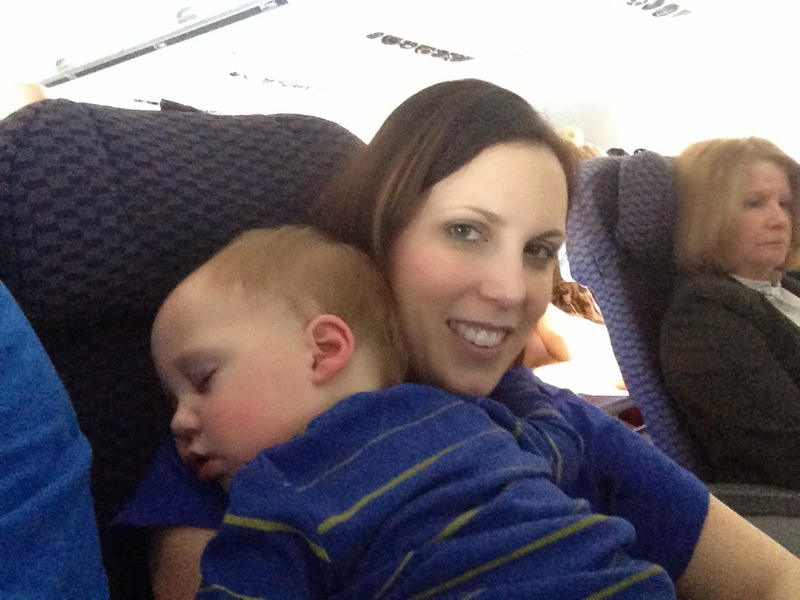 I've never flown with toddlers/babies before, but it seems like a hit or miss kind of thing! Hope you're enjoying yourselves :) Thanks for sharing these pictures! Noah is adorable!